Setting your kiddo up for a successful day all starts in the lunch box. Milk is packed with nutrients that build strong bones and teeth, help reduce stress and boost energy. However, keeping this delicious and nutritious drink chilled until lunchtime can be a challenge. Here are a few tricks I’ve tucked up my sleeve. Another trick I have learned that helps thwart my kids from trading or completely ignoring drinking their lunch box with flavored milk. 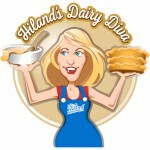 Hiland Dairy Strawberry Milk, Chocolate Milk, or seasonal flavored milk including Egg Nog, Pumpkin Spice or Chocolate Peanut Butter Milk are always a hit. For the seasonal flavors, I pour the milk into an airtight thermos that’s been chilled in the refrigerator overnight. For all our friends with sensitive tummies, Hiland Dairy also produces farm fresh Soy, Almond, and Lactose-Free options!